Why? The hot dogs from the outdoor barbecue are extremely popular. The barbecue doesn’t see action every day, so make sure to plan in advance. A fabulous spot to stop and reinvigorate yourself before heading to the Heath, or for filling up after a long walk. Why? You’ll get some seriously good BBQ here as soon as the mercury hits a suitable number of degrees and The Florence opens up their outside bar, in their absolutely lovely pub garden. The Florence is particularly kid-friendly (until 7pm), boasting a kids’ play area in the garden, a kids’ menu and activity sheets. Dogs are also welcome, if your babies are canine. Hit up the lido before for a swim – but not afterwards! Why? The Jam Tree’s multiple accoutrements set it up to be a great night out ni the summer. 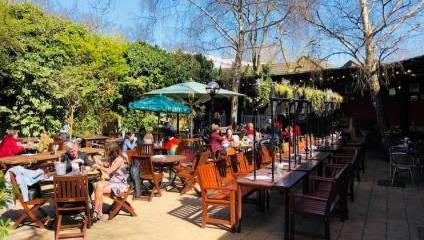 It’s got a sun-drenched beer garden with an outdoor bar and, of course, a great BBQ, even offering veggie and vegan options ‘to entice even the most hardened of carnivores’. Why? You definitely won’t run out of space here– the garden can seat 300, so bring your friends and get in line for a tasty burger or hot dog. Located on the not-so-pastoral St Paul’s Road, you certainly won’t forget you’re in London, but it’s all part of the charm.